Town house, with patio and terrace. Located in a central area of the old town of Xàtiva. Useful area of 150 m2. It is distributed in:Ground floor: hall, open Kitchen, living room, patio, bathroom and a bedroom. 1st floor: reading room (bedroom) with exit to a balcony with views. Corridor with distributor. Bedroom with built-in wardrobe and balcony with exit to inner courtyard. 2nd floor. The second floor is like a “Loft”, with two additional bedrooms, bathroom and a kitchen area. From here you can access directly to the spacious terrace overlooking the north slope of the castle mountain and the high calvary. 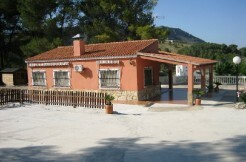 Detached villa, 3 bedrooms with swimming pool, at Xàtiva.